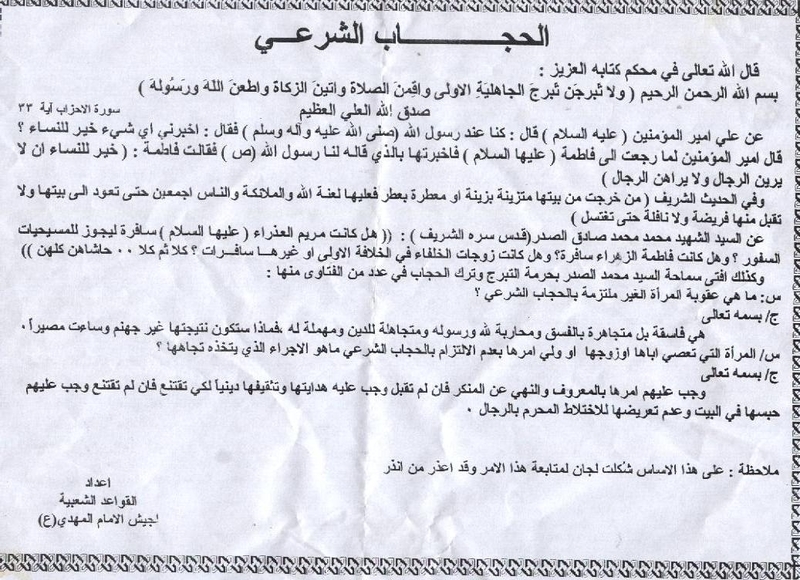 Baghdad (AINA) -- An undated letter issued by Muqtada al-Sadr's Mahdi army to Christians in Baghdad orders Christian women to veil themselves or face grave consequences. The letter, obtained and translated by AINA, states that the Virgin Mary was not unveiled and so Christian women should not be unveiled. The letter ends with an ominous note that committees have been established to monitor the Christian populace and enforce the decree. For the Christian Assyrians (also known as Chaldeans and Syriacs) in Baghdad, the imposition of Shari'a (Islamic law) is coming from both Sunnis and Shiites. On March 18 al-Qaeda moved into the predominantly Assyrian Dora neighborhood in Baghdad and demanded payment of the jizya (AINA 4-17-2007, 3-18-2007), the poll tax demanded by the Koran which all Christians and Jews must pay. Families that could not pay the jizya were instructed to give a daughter or sister in marriage to a Muslim (AINA 5-18-2007). According to Ali, Prince of Believers (peace be upon him), he said, "We were with the Prophet (saas1) and he said, Tell me what is best for women? The Prince of Believers said, when I went back to Fatima (peace be upon her) and told her about what the Prophet (saas) said to us, Fatima said: 'It is best for women not to see men and for the men not to see them.'" According to martyr Mohammad Mohammad Sadiq al-Sadr (Sacred be his noble secret): "Was the Virgin Mary (peace be upon her) unveiled so that Christian women be allowed to be unveiled? Was Fatima al-Zahra unveiled? And were the wives of the Caliphs in the First Caliphate or others unveiled? No and then no…Allah forbid and far be it from all of them." Question: What is the punishment of the woman who does not commit to the legal veil? Answer: In the name of the Supreme Being, She is an adulteress, and she even proclaims sinfulness, challenges and fights Allah and his Prophet and ignores and neglects religion. So what would be her fate but hell and that is best outcome for her? Question: What measure should be taken against a woman who disobeys her father, husband, or her guardian by not committing to the legal veil? Answer: In the name of the Supreme Being, they must order her in a courteous manner to abstain from the forbidden. If she refuses, he then must guide and educate her religiously in order to convince her. If she is not convinced still, then they must imprison her at home and do not expose her to the forbidden interaction with men. Note: Based on this, special committees have been established to follow up on this matter and she who is warned is excused. The People's Foundation for the Master al-Mahdi Army. 1 Sallallahu 'alaihi wa sallam. This is an expression that Muslims use whenever the name of Prophet Muhammad is mentioned or written. The meaning of it is: "May the blessings and the peace of Allah be upon him (Muhammad).